Sourced from carefully selected fruit parcels, this low alcohol Chardonnay Pinot Noir Muscat is fresh and vibrant. Enjoy either as an aperitif or as an accompaniment to seafood or chicken dishes. 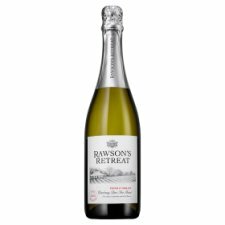 The Rawson's Retreat ranges are named after our founder's family home, "Grange Cottage", which he built in 1845. WARNING: THIS PRODUCT IS STORED UNDER PRESSURE, TAKE CARE NOT TO SCRATCH OR DAMAGE THE BOTTLE AS IT MAY CAUSE IT TO EXPLODE. TO OPEN, POINT BOTTLE AWAY FROM SELF AND OTHERS. DO NOT USE A CORKSCREW TO REMOVE THE CORK. Nestled amongst old Shiraz vines and shaded by a majestic Pepper tree lies Rawson's Retreat - a place of beauty and tranquility built by our founder in South Australia in 1845. Colonial in style with a corrugated tin roof, rustic floorboards and a large verandah, it is unequivocally Australian, just like Rawson's Retreat wines. For over 150 years Rawson's Retreat winemakers have gathered in the shade of the verandah over a glass of wine to share their stories of vintages now and past.